No wonder that some of the most popular destinations of the Northeast are in this state. In its capital, Maceió, tourists will be enchanted by a sea that looks like a watercolor painting in shades of green. Beaches are the big draw of the town, whether it's the green sea of Praia de Pajuҫara or the lively beachfront barracas (kiosk) scene at Praia de Ponta Verde. Apart from clear seas, pristine sands and majes tic coconut groves, tourists have at their disposal a large number of hotels, restaurants, and barracas (kiosks) with live music, "which make Ponta Verde beach the liveliest spot on the city coast. Away from Maceió, visitors have more surprises in store. Jet ski and surfing enthusiasts should not miss the former provincial capital of Marechal Deodoro, parti cularly the popular surfing and sailing beach Praia do Frances. Maragogi, in the far north of the state, is known for its gales (large natural pools). 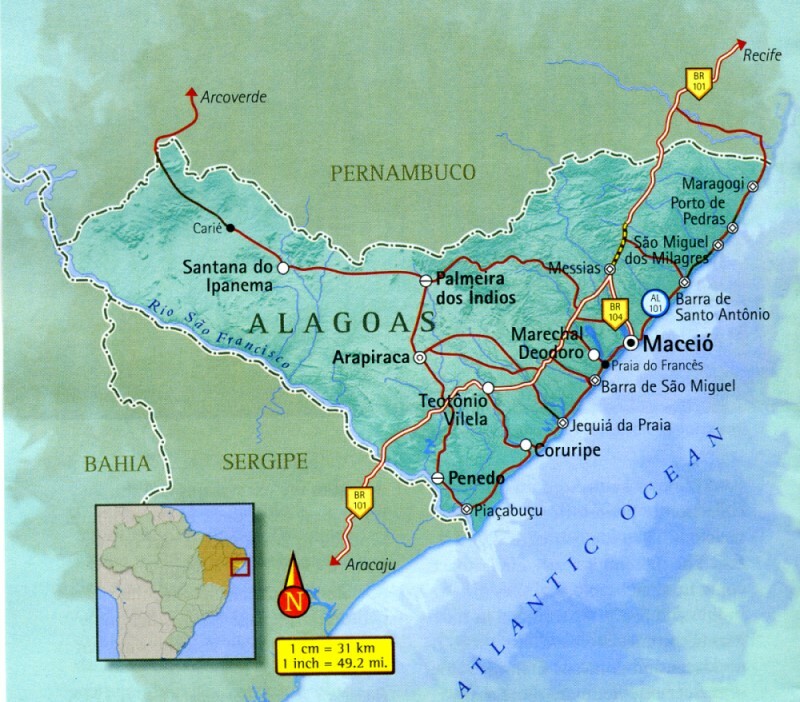 And Piaҫabuҫu, just to the south, is best known as the site of the dramatic "meeting of the waters," where the mighty São Francisco river flows into the sea. • Raft trips to the natural pools in Pajuҫara and schooner trips to the Lagoa Mundaú and Lagoa Manguaba lagoons. • The beaches of Praia do Frances in Marechal Deodoro and Praia do Gunga in Barra de São Miguel. • The Rota Ecológica, a road that links fourteen beaches along the coast between Barra do Camaragibe and Japaratinga. • The traditional lace crafts of Pontal da Barra. • The 18th century architecture of Penedo. • In summer for the best beach weather - perfect for driving the Rota Ecológica ("Ecological Route"), 10 kilo meters (25miles) of astonishing landscape, part of the coral reef itinerary. • In April to see the Festival de Tradiҫões Populares folk celebrations in Penedo, on the banks of the São Francisco River. • In June. to enjoy lively São João festivities in Maceió. • In November for the Maceió Fest, an electrifying out-of-season Carnival.